The Business Application Research Center (BARC) extends its portfolio with the interactive platform “bi-survey.com”. The English-language website is now available at www.bi-survey.com, serving as a central source of information and an authoritative guide to the comparison, selection and purchase of Business Intelligence (BI) and Analytics software. The platform combines the world’s largest database of user feedback on BI and Analytics products (“The BI Survey 16”) with detailed technical and functional product evaluations by BARC analysts. 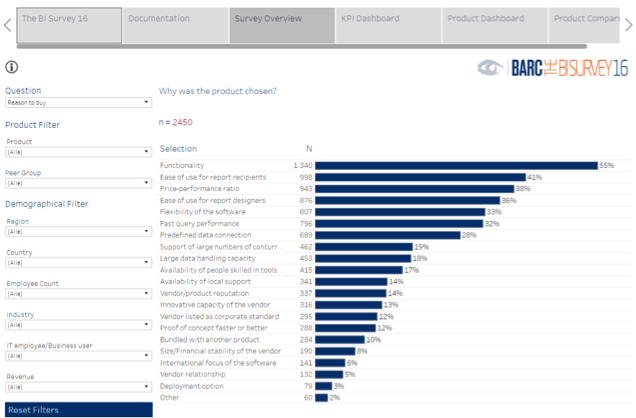 The range of content offered on “bi-survey.com” includes product reviews, BARC research results, infographics, best practice guides for software selection and an interactive “BI Survey Analyzer”, which can be used to analyze the results of “The BI Survey 16”. 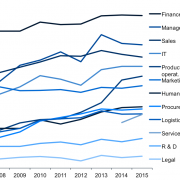 It also provides insights into current trends and developments in the rapidly developing BI market. Visitors to “bi-survey.com” benefit from a unique combination of user and independent analyst reviews of BI tools, revealing the pros and cons of each tool. This blend of analyst expertise and feedback from the users who work with BI tools on a daily basis provides companies with a valuable basis for choosing their own tools. The “BI Tool Comparison“ section contains an overview of the leading BI and Analytics tools on the market based on customer reviews from “The BI Survey 16” and BARC analyst evaluations. Using the “BI User Review Matrix“ (see Figure 1), visitors gain an interactive overview of user ratings from “The BI Survey 16”. With over 30,000 survey responses in 15 years, “bi-survey.com” is based on a unique wealth of data. It offers proven best practice advice on selecting BI software as well as an understanding of why companies choose their solutions, how they use them and how satisfied they are with them. 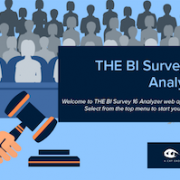 One of the highlights of “bi-survey.com” is the “BI Survey Analyzer”, an interactive online tool that enables visitors to analyze user feedback from “The BI Survey 16” (see Figure 2). The free basic version allows users to generate charts and filter them by region, industry, competitive peer group, company size and more. With the premium version, users can create their own customized shortlist of BI products and compare them based on 32 different criteria. BARC’s “Vendor Performance Summaries” – a series of comprehensive evaluations of the world’s leading BI software solutions – are available as a fee-based service. Each Summary presents and evaluates a BI product in detail. The scope and depth of the “Vendor Performance Summaries” is unique: They contain highly-detailed product evaluations based on BARC analyst expertise and customer feedback across 32 different criteria, as well as an analysis of application scenarios, reasons why customers choose to purchase each product and the problems reported by users. According to The BI Survey 15, BARC’s detailed annual audit of end-user sentiment on the business intelligence (BI) software market, published today. 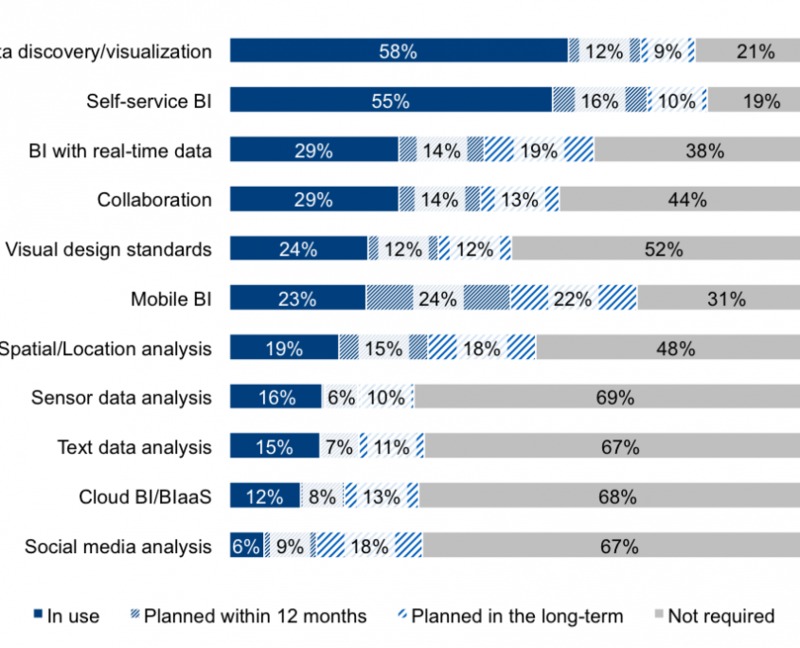 Usage of BI is becoming more pervasive, but remains a long way from being truly widespread in companies, according to The BI Survey 15. Following two years of zero growth, the median percentage of employees using BI in companies increased by more than 2% on last year to over 13%. From a sample of 2,071 responses, 45% of participants say their companies have less than 10% of employees using BI. 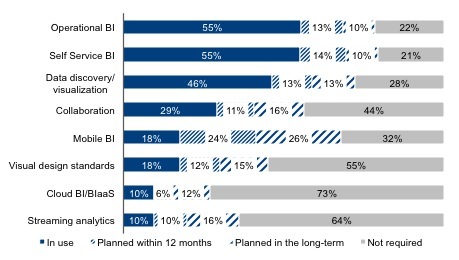 Predictive analysis/data mining is only performed by 20% of respondents in this year’s BI Survey, but it stands to see the biggest gain of all BI tasks in the coming years with a further 40% planning to use BI solutions for this purpose. 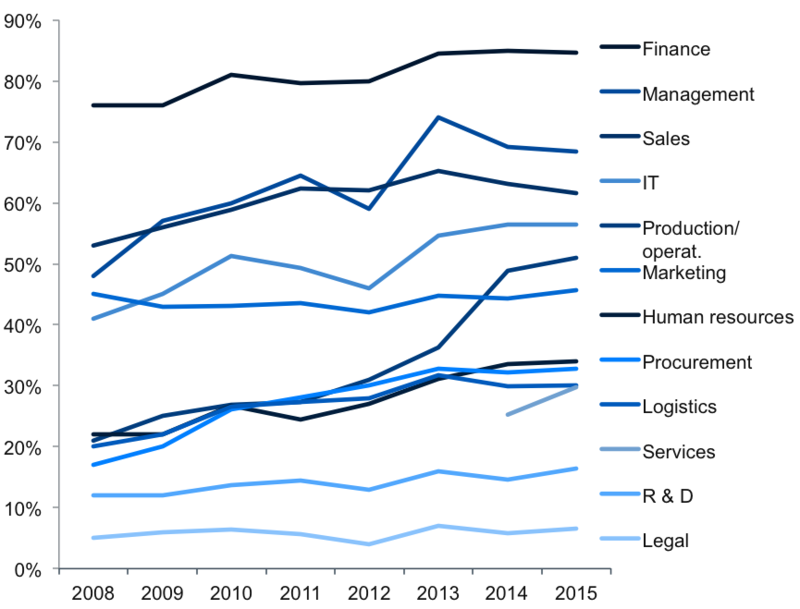 Finance (85%), management (68%) and sales (62%) departments continue to be the leading BI users, but there has been surge of BI usage in production/operations (to 51%) in the last two years. If this pattern continues, production/operations could overtake sales and IT to become the third biggest user of the technology within the next three years. This is just a small selection of the hundreds of findings in The BI Survey 15. Contact us for interview requests or to find out more. 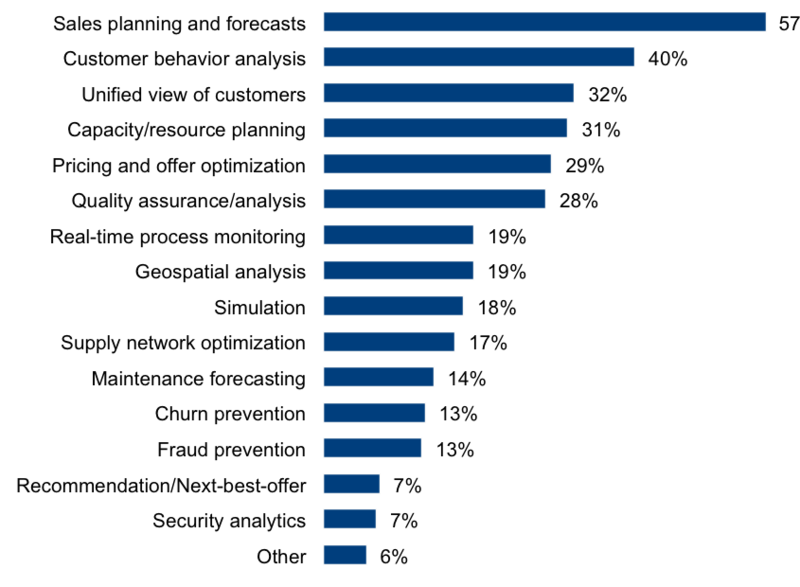 The BI Survey 15 is based on user opinion from over 3,000 BI professionals worldwide about software selection, implementation and usage. Detailed feedback on a record 35 BI products from 30 vendors is analyzed and compared, including international giants IBM, Microsoft (MSFT), Oracle (ORCL) and SAP, as well as BI specialists such as Information Builders, MicroStrategy (MSTR), Qlik, SAS Institute and Tableau (DATA). BARC is an enterprise software industry analyst delivering product evaluations, conferences, market research and consulting to over 1,000 customers each year. 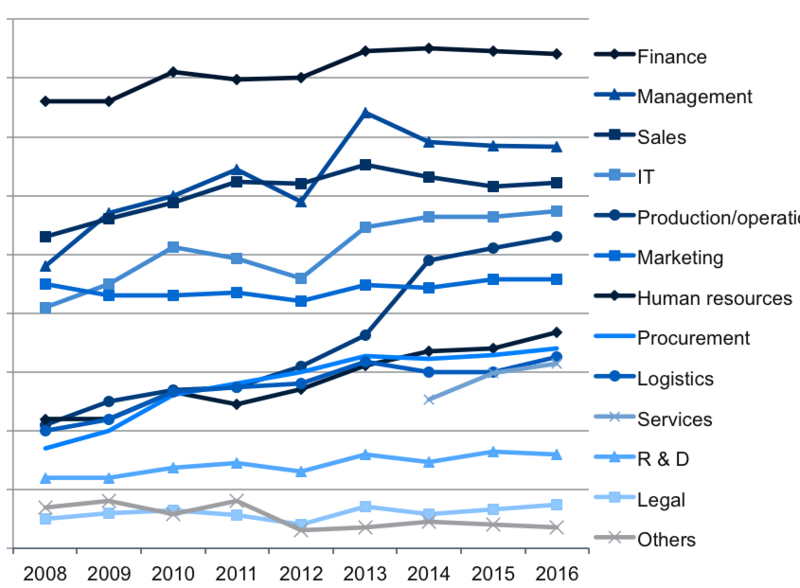 BARC specializes in advising organizations on software selection in its core research areas of business intelligence, data management and enterprise content management. One of many findings from The BI Survey 14 – BARC’s annual survey of over 3,000 business intelligence professionals – published today. 55% of business intelligence (BI) users now claim to be engaging in self-service tasks, with another 24% planning to do so in the future. 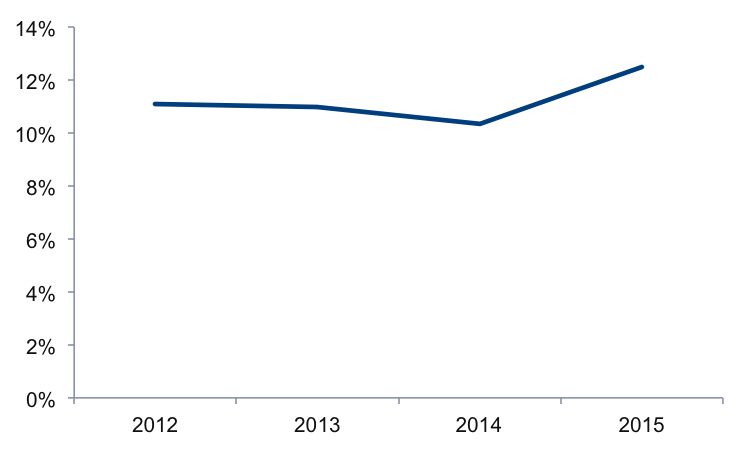 For the third year running, growth in the use of mobile BI has slowed, increasing just 2% on last year to 18%. 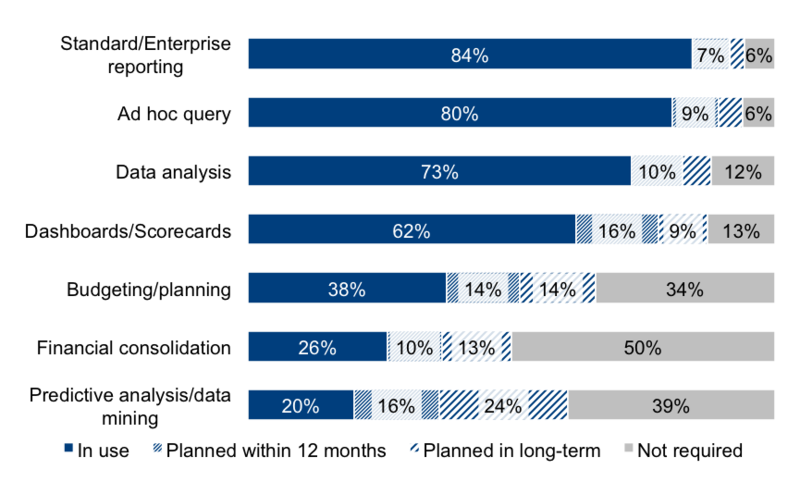 The number of enterprises planning to deploy mobile BI in the next 12 months has also decreased for the second consecutive year. The BI Survey 14 also reveals that 30% of BI users now consider themselves as ‘power users’. The BI Survey 14 is based on user opinion from 3,224 BI professionals worldwide about software selection, implementation and usage. 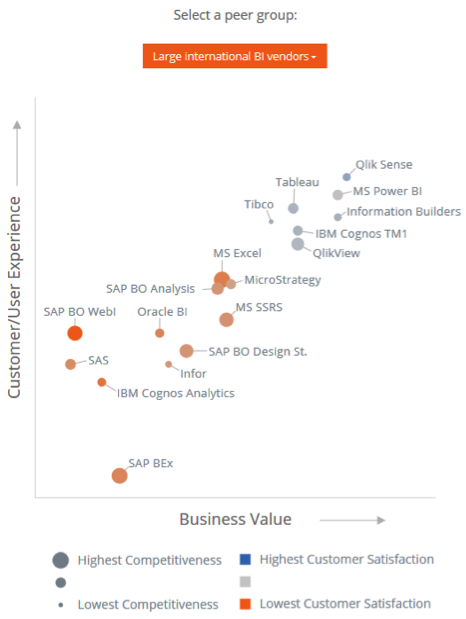 Detailed feedback on a record 34 BI products from 29 vendors is analyzed and compared, including international giants IBM, Microsoft (MSFT), Oracle (ORCL) and SAP, as well as BI specialists such as Qlik, SAS Institute, MicroStrategy (MSTR), Tableau (DATA) and Tibco (TIBX).